My good friend Chris Gregg is up in the North East on holiday, and we had arranged for him to call in for a game while he was in the area. Chris (http://notjustoldschool.blogspot.com/) and I first met through the old A Military Gentleman Forum and then at several annual gaming weekends in Kenilworth over the past four years. He is also the artist behind my Husarettes paintings which adorn the walls in one corner of The Burrow. I thought we could try another game of General d’Armee particularly as Chris’ gaming buddies down in The Cotswolds are keen to try them and were looking forward to his feedback. I’m warming to them a lot now, and despite liking Black Powder for their 'simplicity' find them easy to follow and much more challenging, but fun. The history lesson. 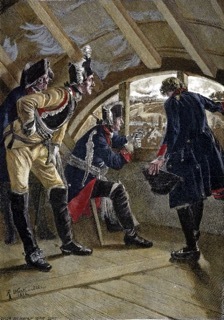 There were several clashes between the armies of the 1st Coalition and the Republican French army of the Moselle under General Lazarre Hoche throughout 1793. 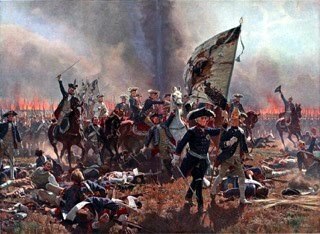 The Prussian army under the Duke of Brunswick was supported by Hessians, Saxons, Austrians and Emigre forces. 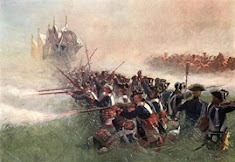 Operations ended following the Prussian victory at the three-day Battle of Kaiserslauten at the end of November when the victors failed to follow up their advantage, allowing French attention to turn towards the Austrians who were defeated at the Battle of Froeschwiller in December 1793. 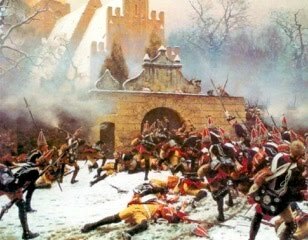 Our battle makes no attempt to retreat any of this, other than it pits my French against my Prussians again, with the Prussians reinforced by a regiment of Bavarians on their first engagement. Chris opted for the French, who had to hold the town and fend off the Prussian attacks, in another attempt to utilise the rules for the early Revolutionary Wars period. Obviously this account is wholly unbiased written as it is by the commander of the Prussian army. No doubt when Chris gets home his version will appear on his blog and might well differ slightly! The sun breaks through the clouds (velux window). Both armies are deployed, with the French pushing skirmishers forward. The Prussians appear rooted to the spot. 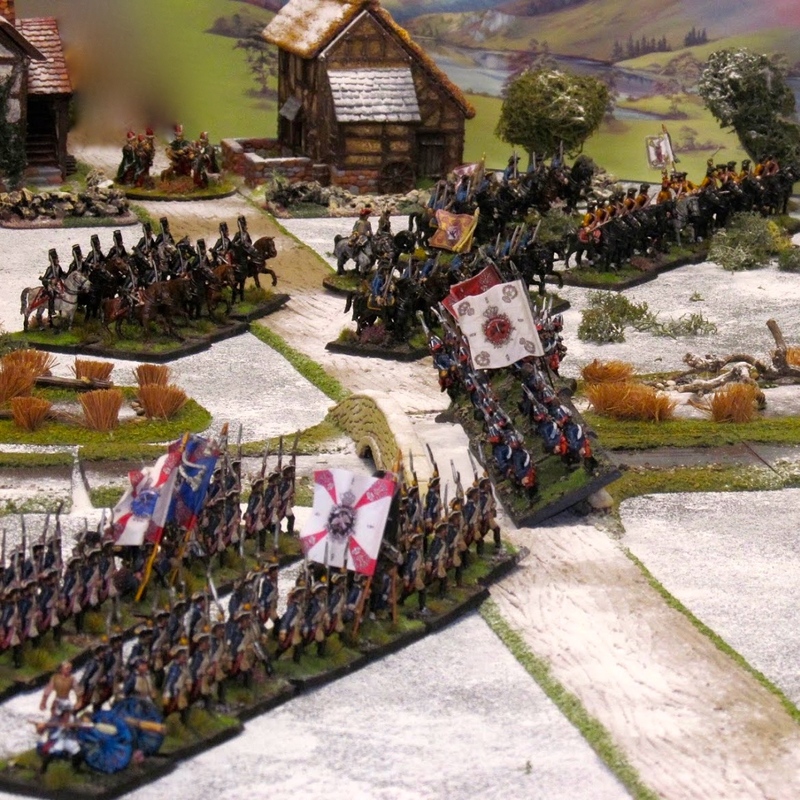 A regiment of Bavarian infantry attached to the Prussians advance slowly towards the French. The Prussian left as seen from the French observing from the clock tower in the town. In the centre the Prussian infantry finally gets the order to advance. Chris taking stock of his forces facing the main Prussian axis of attack. A brigade of French chasseurs a cheval, unfazed by facing the Prussian cuirassier brigade opposite them. The Prussian centre poised to attack...hahahahah! I used most of my ADCs to ensure that these two brigades could advance as far as possible, thus screening my cavalry to their right from the attention of the French artillery. The Prussian cuirassiers clashed with the French, routing them. I was unable to exploit my success. The following turn Chris had to roll on the faltering brigade table and passed with flying colours so it wasn't long before the chasseurs were back in action. Hidden away among the cuirassiers was a battery of horse artillery that I had forgotten about for several turns. When I did remember them they were pushed forward to soften up the remaining French to the front of my cavalry. Chris threw in his remaining cavalry regiment and miraculously drove my cuirassiers back! My grand battery in the centre looked good but did very little actual damage! Meanwhile in the town preparations were being made should the French loose the battle. Loosing didn't seem very likely for the French at this time as they'd blunted my cavalry attack in the centre and were beginning their own on their right. The French heavy cavalry kept two of my infantry brigades pinned down for much of the game. (The two brigades deployed on this flank were my worst troops but he didn't know that). The French field bakery in full swing. The young lady stomping on the dough seemed to have incredibly hairy legs but maybe they'd add a bit of fibre to the mix. Urgh! I threw caution to the wind and launched my centre in a full-blooded assault against the French 12pdrs. Yes, it was a foolish move but as it turned out the 12pdrs failed to stop me and were overrun, the gunners bayoneted or fled and the guns captured and taken to the rear. On the far right my fusilier brigade and attached jager were making heavy work of dislodging a demi-brigade of French light infantry from the woods. Casualties were mounting and it wasn't long before the leading battalion was destroyed. With the entire brigade now faltering I could forget about this flank for now! The Prussian artillery in the centre still hammering away. I think I caused more fatigue casualties on myself than actual hits on the enemy. The Prussian attack in the centre at the point they survived the closing fire from the French 12pdrs. Seen from the French side the battery is overrun. One of my cuirassier regiments sped off into the distance with their brigadier at their head to try and punch a hole through the French line. 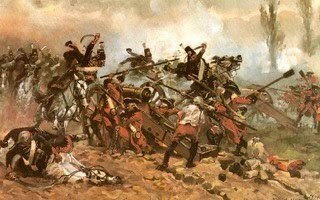 They succeeded in routing the enemy cavalry but this then put the other two regiments of the brigade out of command! Doh! The surviving French cavalry tried to take the distant cuirassiers in the flank but were too bad a shape to do any damage and were forced to retreat. Meanwhile, in what turned out to be the last turn Chris launched his carabinieri regiment at my infantry. I had decided to advance and try and force them to charge, which they did. The target other charge stood unformed and was then forced to retreat. The carabinieri followed up into the second battalion, driving it back also. Meanwhile my victorious infantry in the centre had been unable to extricate themselves from the wreckage of the battery and were hit in the flank by fresh French troops and dispersed. We called it a day at this point as it was clear that the Prussian attack was not going to succeed. At least we could retreat with our booty (eight 12pdrs) and lick our wounds. With three faltering Prussian brigades to one of French and no obvious advantage to be gained by throwing my men at the French it was probably a fair result as the Prussians had been fought to a standstill. Standing still had been the big problem at the start as in the first few turns I had very few ADCs to play with. My master plan had been to punch through the centre with the cavalry and the two brigades of infantry, but to DO IT AT THE SAME TIME! The French held off my fusiliers on the flank expertly and my artillery was unable to exploit its local superiority when it mattered. So, thats three games now using these rules and I have to say I do rather like them. It'd be nice to win a game but as the host and umpire I think I did really well to come second! I made a couple of mistakes interpreting the rules during the game but I don't think they detracted from the enjoyment or the result. I enjoyed the game thoroughly and hope Chris did. I am very pleased with the look of my Prussian army even if their stats so far are 'played three lost three' . They did get a bonus point each for capturing the guns and looking very pretty but thats no real consolation. I don't know if I've got the troop capabilities right yet, in fact I suspect I don't, for either army. Next time I will use Russians or Austrians, or maybe my English. We shall see. Smashing photos and AAR there Colin, enjoyed that. But, P 3 L 3, been there, done that! Always enjoy your AARs and also always happy to see the French win too! Those cannon must be part of your Imagi-Nation then! Put me down for a souvenir T shirt please for next time!